To properly complete your Lone Ranger costume, you’d need the mask the main protagonist John Reid wears in the 2013 Disney’s motion picture! Played by Armie Hammer, John Reid becomes a reluctant masked rider and alongside with his colorful partner Tonto starts pursuing the notorious Butch Cavendish and his gang! 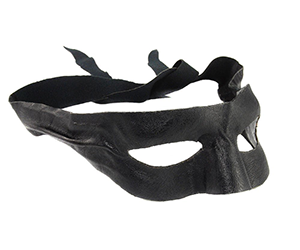 Made of durable and high quality material, this mask replica ties behind the head and transforms you into the Lone Ranger!